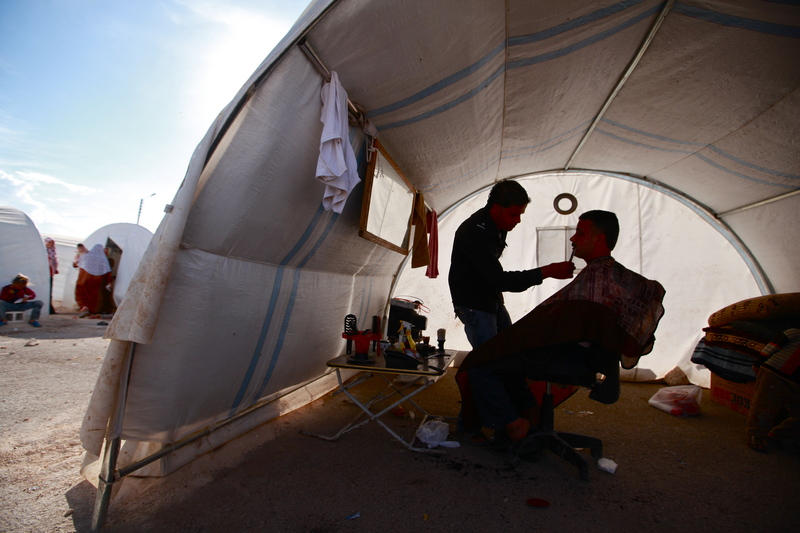 7,250 refugees are camped at the Bab al-Salam border complex in Syria. As winter approaches, the humanitarian situation there is worsening. Anyway, it was not my purpose in this post to sing the praises of Rania Abouzeid – though it’s a worthwhile one for the benefit of anyone who hasn’t read her stuff. I’m finally getting it together to post some of my stories. Yesterday I visited the Bab al-Salam border complex inside Syria to report on the looming humanitarian crisis refugees face with the onset of winter. I had visited Bab al-Salam before a month earlier and was shocked both at how the number of refugees has increased and their situation has worsened. On a patch of rubbish-strewn ground, Mustafa Albas rested his broken leg in the fading warmth of the afternoon sun. It was a moment of peace for the farmer, 49, who is sharing a thin nylon tent measuring nine square metres with his two wives and 15 children. They have three narrow mattresses between them. The family is among several thousand people camped just inside Syria at the Bab al-Salam border complex, dreading the hardships to come as winter approaches. “Just a day ago there was rain and there was water in our tent. Soon it will be so cold we don’t know what we will do,” said Mr Albas. There are fears that winter, when temperatures can regularly drop to freezing, will bring a vast humanitarian crisis. Hundreds of thousands of Syrians have been displaced by the country’s civil war and they now lack basic shelter, clean water, clothes, bedding, medicine, and baby milk. “We need everything,” said Sabiha Omar, Mr Albas’s wife. Two months earlier a bomb from a regime jet hit their home in the town of Maraa, near Aleppo, injuring four of her children. Her 15-year-old son, Mohammad, was rushed to Turkey, his belly torn open by shrapnel. The same day, her husband broke his leg when he crashed his motorbike as he rushed home to check on his family. 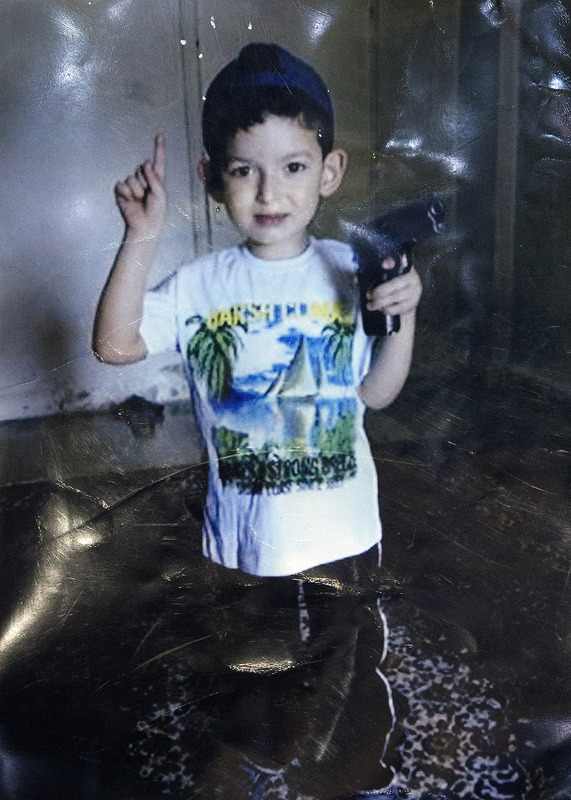 They moved to Bab al-Salam 20 days ago after Mohammad had to leave the Turkish hospital where he had been convalescing. “He should have stayed but they said there wasn’t space for him because they had more urgent cases,” said Mr Albas. 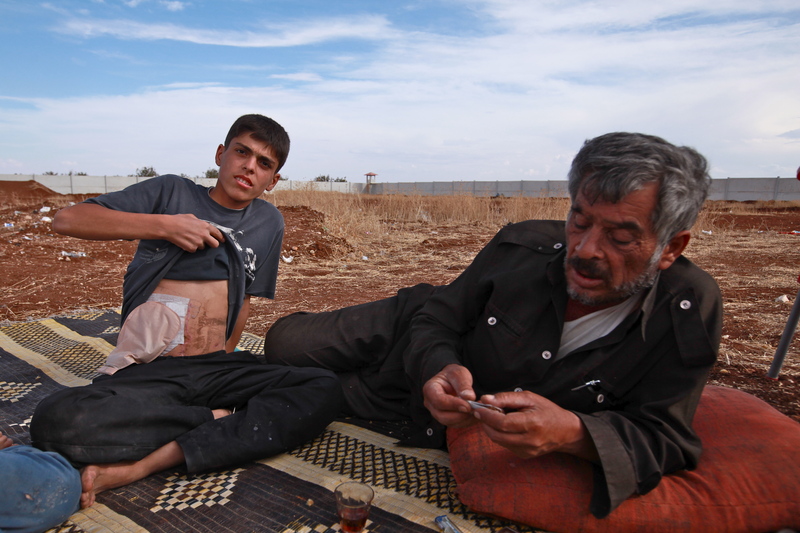 Now Mohammad wears a colostomy bag as he awaits a further operation on his intestines. “We want to go back to Turkey to get a new one but they will not let us in,” he said. Most people are camped inside what were custom inspection hangars for lorries in the days when Bab al-Salam was a bustling border gate. Two days ago a storm blew through, knocking over many tents and leaving the rest soaked inside. Water poured through the roofs of the hangars. Out-of-date food, a lack of medicine, and dirty water is bringing illness, particularly among the children, many refugees said.“They are cold and they have diarrhoea and they are throwing up,” said one mother. Of the 7,250 people at Bab al-Salam, 4,000 are children, and 1,750 are aged two or under, according to Abd al-Kader Kaptur, the camp’s aid manager. “Every day more and more people arrive,” he said. “Just now about five buses have come with maybe 200 people.” Other than food sent from the Turkish charity IHH, the refugees are receiving almost no organised assistance, he said. Conditions are already grim in the camps that have sprung up on Syria’s borders but a far more serious crisis threatens. Aid agencies expect 710,000 Syrians to reach neighbouring countries by January, almost three times the 246,000 there as refugees at present. An estimated 1.2 million are also displaced within Syria’s borders, according to the United Nations. Winter is near. Between December and March in Syria the average temperature is 2C (36F) in inland areas. Rains have arrived, snow will follow, and hundreds of thousands of refugees are living under canvas. By one estimate the country’s economy shrank by 15 per cent last year and will further contract by up to 35 per cent this year — driven by the conflict and sanctions. Regime officials have encouraged families to start keeping chickens as the food supply becomes strained.The UN estimates that $348 million will be needed to the end of the year for the refugee crisis. Only about 40 per cent of that figure has been pledged so far by the international community. I will continue reporting on the refugee situation on the border over the next few days. Last week, I was reporting from Akçakale on the rising military tensions between Turkey and Syria. I think talk of all out war is overblown. Syria is in no position to retaliate in any serious way to Turkish aggression. Once Turkey, or the Syrian rebels, have taken out regime positions that are close enough to the border to hit Turkey, these tensions will likely drop. Achieving this, however, may yet involve cross-border commando operations, or even air strikes. Of course it’s possible that the Syrians will then resort to long range rocket attacks on rebel held positions close to Turkey, introducing yet more scope for accidental strikes inside Turkish territory. Of course, Turkey’s artillery response to Syria has once again upped the ante for Ankara, investing it more deeply in Assad’s defeat. While the possibility seems remote, if Assad were to re-establish control of Northern Syria it would put the Turks in an extremely difficult position, and in my opinion it would more or less force deeper military involvement on their part. It’s also worth remembering that the regime has threatened to use its chemical weapons against foreign aggressors. This may not be a bluff Turkey wishes to call, but knowing how Turkish public opinion works, any direct attack by Assad on Turkey would radically shift public opinion – currently lukewarm – in favour of direct military intervention. for this reason, I think it’s unlikely that the regime would use their chemical weapons against Turkey. Standing lost and bleary-eyed amid a stream of mourners yesterday, Ismail Özer struggled to comprehend a day in which his wife, sister, and three nieces had been laid in the earth. “I cannot talk now. The ones who have died … What can I say?” said Mr Özer, 42, at a community centre in the border town of Akçakale, following the funeral of his family members, killed by a stray Syrian mortar round on Wednesday. “I was looking at them when it happened,” he said. The family’s tragedy has put it centre-stage in a community — and a country – gripped by foreboding at the prospect of being dragged into its neighbour’s civil war. Nato member Turkey’s parliament yesterday gave the government a green light to launch military operations inside Syria, after it shelled Assad regime positions in retaliation for Wednesday’s deadly strike. The motion, adopted by an overwhelming majority, gives the government a one-year mandate for operations beyond its borders if they are deemed necessary for national defence. “Turkey has no intention to go to war,” said Turkish Prime Minister Recep Tayyip Erdogan yesterday, adding that the mandate for cross border operations was meant as an ‘effective deterrent’. 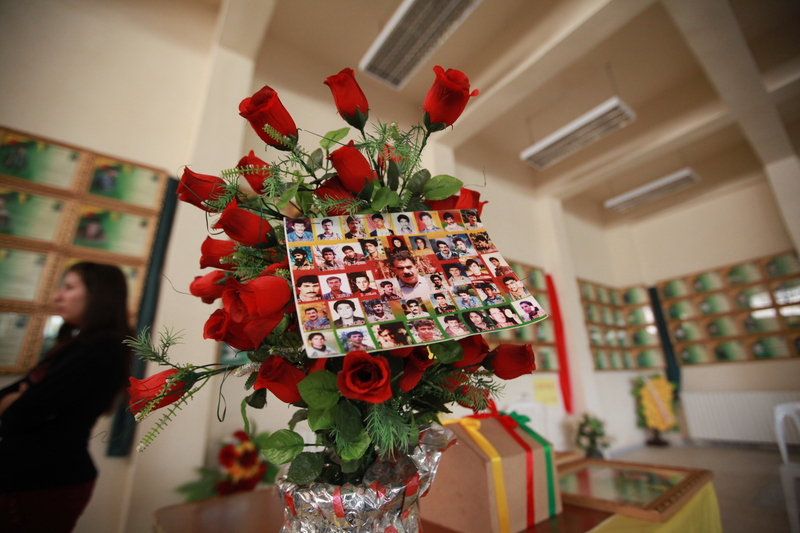 For its part, Syria formally apologised for the deaths. Several Syrian soldiers were also killed when Turkey fired back for the first time against its southern neighbour. The exchange of fire between two well-armed regional powers prompted calls for restraint from around the world. These fears were shared by residents in Akçakale. 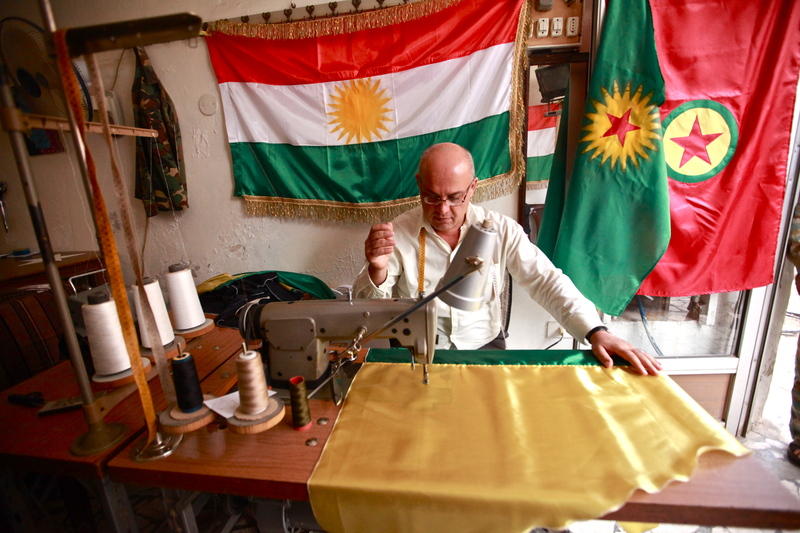 “We do not want war,” said Mustafa Taka, a 58-year-old civil servant. “But if they push us we will have no choice.” Yesterday, for the first time in two weeks, the thump of Syrian mortar fire could not be felt in the border town. The shelling had begun 16 days ago when rebels fighting Bashar al-Assad’s regime seized the Tal al-Abyad border complex just 200 metres inside the Syrian frontier, making it a target for regime artillery. Since then several Syrian mortar rounds have fallen on Turkish soil, causing no injuries. But about 100 schools in the region have remained closed, and many people have left to stay with relatives elsewhere. “If we didn’t have animals we would have left a long time ago,” said Ahmet Çildan, a farmer whose home on the fringe of the town lies close to the border. “Now we come here in the day to work and we leave at night.” The Syrians stopped shelling after the Turks began their own artillery bombardment at around 6pm Monday, residents said. Outside the house where the Özer family had been visiting their cousins the Timuçins on Monday afternoon, the wall was flecked with dried blood and pocked with shrapnel. The dead included Mr Özer’s wife Gülsen, 40, his sister Zeliha Timuçin, 39, and her three daughters Fatos, 14, Aysegul, 12, Zeynep, 8. Mr Özer’s daughter Özlem, 8, is in hospital, among 11 people wounded by the two mortar shells that struck the town mid-afternoon on Monday. A third hit a grain depot. 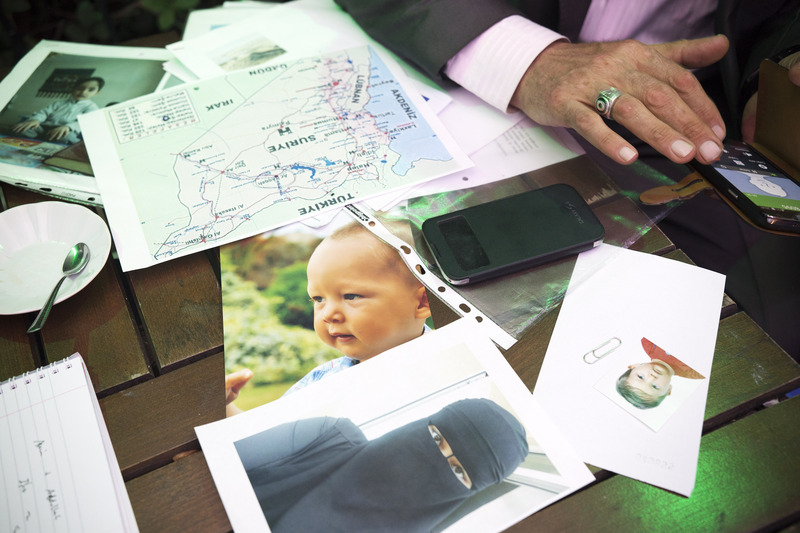 “She has left four children,” said Mrs Özer’s brother Ali Sonis, 37. “One is in the hospital and another is only one-and-a-half years old. The baby is in shock, it does not even cry.” Like many in the town, he was angry that the Turkish government has reacted only after lives have been lost. Turkey is already shouldering the brunt of the Syrian refugee crisis, sheltering 90,000 people in camps along the border. Theoretically under Nato’s charter, an attack on a member state can allow collective retaliation, but the clause specifying such action was not invoked by Nato, which is wary of being dragged into yet an Iraq-style quagmire. Syria’s key ally Russia blocked a UN draft resolution condemning the attack, watering down the text to call for “restraint” on the border. But Russian Foreign Minister Sergey Lavrov on a visit to Pakistan said he was worried at the dramatic turn of evenst. “It is of great concern for us. This situation is deteriorating with every coming day,” said Mr Lavrov, who said Damascus had assured him such an event would not happen again. Last night Russia signed up to a watered-down UN Security Council statement condemning the Syrian mortar attack, describing it as a “violation of international law”.